What better start to your life together as Mr and Mrs than a honeymoon or wedding in the Caribbean? Here are five memorable spots. Barbados: With miles of sun-drenched sands graced by towering palms, turquoise waters, and a warm temperate climate, Barbados is easily a lovers' paradise. Barbados infuses romance into every inch of the island from its dramatic scenery to its fabulous and intimate dining, glorious sunsets, and colourful nightlife. Corrib Travel’s top hotels: Sandy Lane, Colony Club, Fairmont Royal Pavilion, Sandals, Mango Bay. Jamaica is teeming with culture, nightlife, and natural beauty spots, delicious and distinctive cuisine, soothing spas, a host of activities and attractions, historic houses, botanical gardens, and stunning white sand beaches. Corrib Travel’s top hotels: Secrets St James, Secrets Wild Orchid, Sensatori, and Royalton White Sands. Aruba has long held a certain mystique for holiday makers from all over the world. The island offers some of the best shopping in the region and a buzzing nightlife, not to mention lots of great tour options to neighbouring islands. Located away from the hurricane belt, the island has an arid climate. Corrib Travel’s top hotels: Bucuti Beach Resort, Manchebo Beach, Divi Village, Hyatt Regency Aruba. 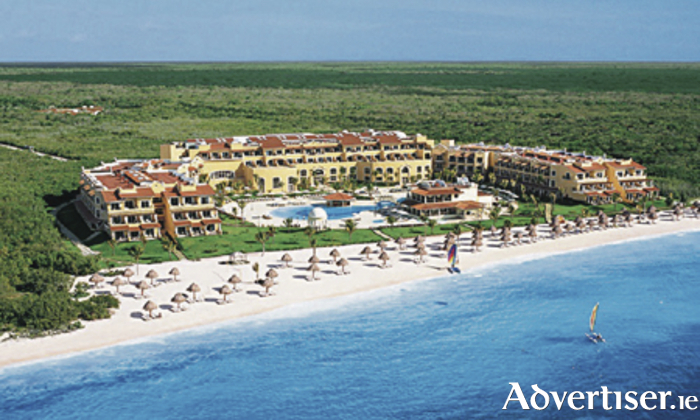 Mexico: Discover the fascinating world of Mexico. There are several hidden treasures just waiting to be explored. Ancient Aztec pyramids, authentic foods, and fantastic shopping. Whether you are looking to visit past civilizations or simply lie on the beach and work on your golf game, Mexico can accommodate . Corrib Travel’s top hotels: Secrets Hotels, Moon Palace, Hard Rock, El Dorado Maroma. St Lucia: Nestled in the heart of the Caribbean and renowned for its natural beauty, Saint Lucia is an idyllic location for couples. The lush unspoilt rainforest and sun soaked beaches complement a world class choice of accommodation, from boutique mountain hideaways to luxurious spa resorts. Corrib Travel’s top hotels: Anse Chastanet, Rendezvous, St James Club, Ladera Resort, Body Holiday at Le Sport. Corrib Travel will be attending the wedding fair in The Ardilaun hotel on Sunday November 6 from 2pm to 5.30pm, and the team will be happy to answer any questions. You can also contact Corrib Travel on 091 564713 or drop in to 2 Eyre Square.